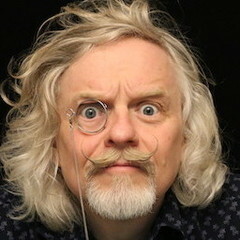 Marty Jopson takes a look at the 2018 re-release of Chaosium's Call of Cthulhu campaign. Like the monstrosity that stands astride the pyramid on its cover the Masks of Nyarlathotep campaign stands over the legendarium of the Call of Cthulhu role playing game. This is the big one. 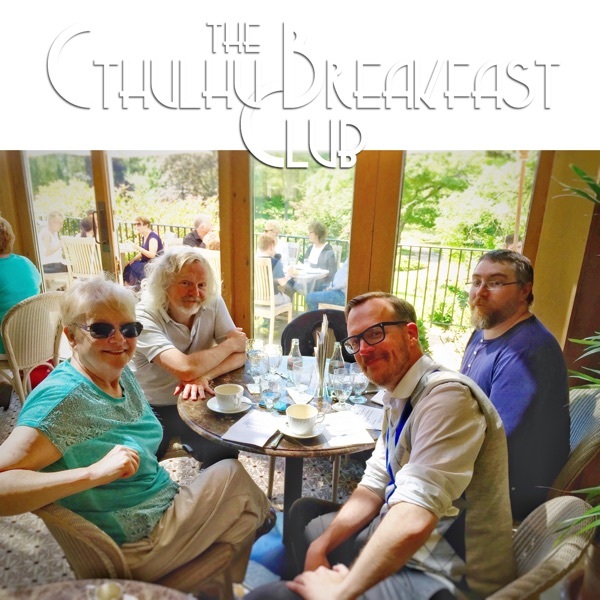 This campaign splits Call of Cthulhu GMs into two groups: those that dream of running it and those who gather in dimly lit pubs and tell tales of the scars they have inflicted upon their players as they crawled through this notorious meat-grinder of a campaign. I fall within the first group of GMs. The closest I have personally approached Masks of Nyarlathotep is playing a bit of the Kenya chapter using super hero characters. If I recall, despite our super powers, it was still pretty deadly. So, when Mike Mason approached PoC with a review copy, my hand went up the fastest. This new version of the campaign comes to us as a stonking great PDF. While the print version will ultimately be in two hard backed tomes, the PDF has wisely been squeezed into one volume, and oh, how they must have squealed with maniacal delight when they realised that it would hit exactly 666 pages in length. Despite this number count the file comes in at a very svelte 52 MB. Somebody clearly spent some time optimising their compression settings, which I really appreciate as my iPad is old and clunky. Along with the main PDF is a veritable cornucopia of goodies and while it is very tempting to start with these accompanying fripperies, I shall apply some restraint and come back to them later. Instead let me lead you to the raw and exceedingly bloody meat of this campaign. The PDF is laid out using the same graphic style found in the Pulp Cthulhu and Two-Headed Serpent releases. Each page has an old-book background with arcane runes up the left ("Serpent of Yig"), a few under-text watermarks and images either painted on or pasted in as photos. It doesn’t have the clean lines of something like Pelgrane's Cthulhu Confidential, but I like the feel that Masks of Nyarlathotep evokes. The images are great and there are lots of them. This is going to be a spectacular book when it finally comes out in dead tree version. Aside from the evocative illustrations and copious use of period photos, all of the handouts have been given loving attention - and there are so many of them! Chaosium has taken the time to make the handouts look fantastic and I’m a handout nerd. I usually end up re-doing many of the official handouts from a scenario, but all of the Masks of Nyarlathotep handouts are up to my anally-retentive standards. It's worth mentioning the maps at this point, they are gorgeous and unusually for me, I don't think I will be seeking out any additional ones. There also appears to be a character portrait for every single NPC, and not just the major ones. All the little, one-scene NPCs get a portrait too - more on this later. So, it's a pretty thing, but is it usable? This is a complicated campaign with multiple sand-box scenarios set within a bigger sand-box meta-plot. 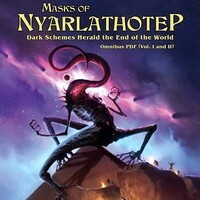 I do own one of the previous editions of this campaign, the 4th edition, entitled the Complete Masks of Nyarlathotep, released in 2010. I never ran it but I recall thinking after reading this earlier version that while it was an amazing plot, I was somewhat daunted by it. I suspected it was going to be tricky juggling so many NPCs, handouts and plot threads. I don't get that feeling reading the new version. It’s laid out logically, each chapter well organised and it has an extensive index at the back. The PDF is also really well bookmarked which is essential, even for just writing this overview. The book starts with a really well thought out Introduction that summarises the bigger plot threads and gives advice on how to run the campaign. There are succinct details on all the big players and a timeline of events that I found myself referencing regularly as I read through the main chapters. This stuff is good and I've come to expect this in a campaign book. What I was delighted to see was the advice on Preparing to Play, including what sort of characters your players should roll up, what to do when they all die / go insane and how to introduce new player characters at each of the major locations. I've not seen this ever done as well before.There is also a really good selection of ten pre-generated characters. Once again the thought that has gone into producing this slate of pre-gens is going to be appreciated. No matter where you are in the campaign, if you suddenly find yourself needing a new player character, one of the pre-gens will fit in without any effort. The main plot of the campaign is split into country based chapters. Each chapter starts with advice on how to get the players to this point and what consequences playing other chapters will have had. While there is a standard, default sequence to the campaign there is no telling what order your players will tackle it. Then, similar to the Introduction we get a summary of plot, key adversaries and allies and then the body of the investigation and action. A really nice touch that illustrate the efforts Chaosium have made is that each NPC portrait is set within a frame, coloured green for allies and red for adversaries. It's a small thing but given the number of NPCs it makes even reading the book easier on the brain. It's things like this that I suspect will make running the campaign easier. Talking of making it brain-friendly, each chapter has a clue diagram with handout references and every scene has a list of all the possible previous scenes that would lead the players to that point. Hopefully you are getting the picture that this is not only a very lovely book, but also designed from the ground up for the GM to run a game from it. The actual adventure found within its pages is also top notch. The bulk of the campaign is, not surprisingly, the same gloriously hideous plot as found in the prior editions. I am no scholar of how this campaign has been changed over the years but there is a whole pile of additional material. There are a total of six "sidetracks" included in the campaign, all of which can be skipped to reduce the campaign length. However, each sidetrack adds something to the players understanding and possible survival in the long run. None of these appear to be completely irrelevant to the main plot. In addition Chaosium have added a prologue chapter in Peru to get around the Jackson Elias issue. The campaign traditionally starts with a request for help from your “good friend Jackson Elias.” I'm sure there are GMs out there who have groups who all immediately start inventing stories of why and how they came to know Jackson Elias, but I can guarantee that in any group I have run for there will be some joker who pipes up “Oh no, not Jackson Elias, my character never got on with him.” Problem players - you know who you are. Hence the need for the prologue. And it's a cracker! It plumbs into a part of the world otherwise unexplored by this campaign and taps some classic Call of Cthulhu tropes. It is neither too long, nor too simple and should do the job of forming a bond between the party and Jackson Elias. Importantly, while it is definitely dangerous it is not overly deadly, which is good as I imagine it would be disheartening if a character bites the dust before Chapter One of the campaign. While the Peru chapter would stand perfectly well on its own (and make a good convention scenario), it also foreshadows the main plot in quite a few different ways. The older material in the campaign has, I understand, been tweaked and primped to make it less randomly lethal. Now, I know that this extreme lethality it is a badge of pride among many GMs that have run previous editions of Mask of Nyarlathotep, however I think role playing games has subtly changed since those heady games of the 1980s. Role playing is less adversarial than it was back when Mr. Gygax first started running his players through dungeons. While Call of Cthulhu has always been different, a fantasy of inexorable doom rather than accumulation of power, those early campaigns set out to kill off players characters and hammer home the nihilism of the Lovecraftian mythos. But role playing these days is about collaborative story telling, players want to tread the fine line between annihilation and a continued story. Constantly having to repeatedly introduce new characters can really strain the verisimilitude. This version of Masks of Nyarlathotep looks plenty lethal to me. There are many, many ways to lose a character in here, they just seem a bit less random and offer a possibility of just maiming the player character rather than killing them outright, which seems more fun to me. While I am on the subject of lethality, I should mention the addition of Pulp Cthulhu rules. Throughout the book there are side bars that give advice on how to turn the Pulp-o-meter dial right up to 11. Adversaries are given boosted stats or extra minions, additional fight scenes and chases are suggested and all the pre-gen characters have their increased Pulp statistics and powers. But I’m not sure that this is a Pulp campaign. I'm a big fan of Pulp Cthulhu and currently running the Two-Headed Serpent campaign, which really does feel gung-ho and pulpy. Masks of Nyarlathotep on the other hand does not have quite the same feel. This was and still is a heavily investigative campaign, crammed with clues, NPC interviews and library use rolls. If library use is a useful skill, is it a Pulp campaign? I'm still trying to make up my mind on this one. It is certainly not a high-pulp campaign with all the craziness found in Two-Headed Serpent, and running Masks of Nyarlathotep with Pulp rules will definitely change the experience, not least improving the chances that one or maybe even two characters makes it the whole way through. One considerable and important change to the campaign has been to balance some of the more troubling portrayals of race and culture that did not seem so jarring thirty years ago when Mask of Nyarlathotep was first released. I was particularly taken by the way they turned the stereotypical portrayal of African culture in Harlem, New York, into a scenario I would not feel uncomfortable running. The racial diversity of characters has been thoroughly mixed up, but not in a way that feels forced. To old hands revisiting the campaign the most noticeable change will probably be that for the new edition, Jackson Elias is an African-American. It was done so seamlessly and interwoven so well into new background material that it was only when I pulled out my older version did I realise the switch. Phew! So that's it then? That is the new Masks of Nyarlathotep? No - there is more, so much more! I mentioned right up there, 1,500 words ago, that the PDF came with a pile of extras, and I have to spend some time discussing these. First up is the cover art for the two print volumes that is supplied separately as a pair of really high resolution files should you want, for example, to use them as desktop backgrounds. I know there has been some back and forth on the interwebs and forums about these. I like them, especially when seen together and look forward to seeing them in print on the books. Next up is the Keeper Reference Booklet that contains all the stats for adversaries and allies organised by chapter. Within the main book itself these are found at the end of each chapter, but it is a handy thing to have them all in one place. Chaosium did this for the Two-Headed Serpent campaign and I have found it very useful in play. It's a shame that the PDF of the Reference Booklet is not bookmarked, it would be good to have at least the chapter headings marked up. Player handouts are a vital part of the classic Call of Cthulhu gaming experience and Masks of Nyarlathotep abounds with them. I have already mentioned that Chaosium has gone to great lengths to make the handouts look great - using funky fonts, backgrounds for text handouts and producing actual drawings of items rather than the line drawings used in the original campaign - but they have gone the extra mile and collated them all in one 96 page PDF booklet. Each handout is numbered and labelled, so that you as GM know what you are looking at, which seems like an obvious thing to do, but sometimes doesn’t happen. On top of all of this loveliness every single location map is reproduced as a player facing handout, by which I mean all the labels removed and secret bits taken off. 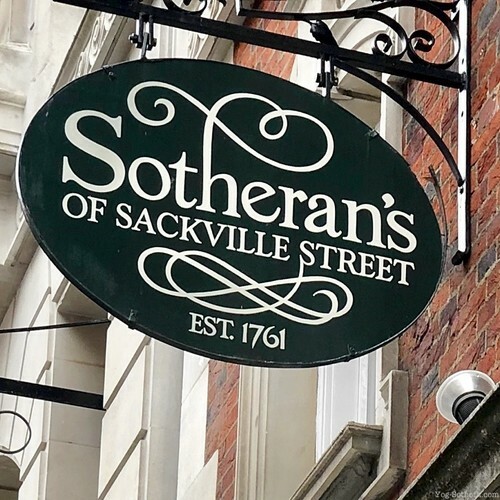 This makes me very happy as after many years I have come to realise the pointlessness of the D&D habit of incrementally revealing the map of a location. This fog-of-war is important when dungeon crawling, but when investigation is the game I just give my players a map of the whole location and ask what they want to do. You are not revealing spoilers as the exact relative placement of the bookcases, beds and water closets really does not matter. Included in the handout pack are also all the evocative period country maps and finally an abbreviated version of the ten pre-gen characters, each given a page. For the pre-gens, the extra effort by Chaosium extends yet further to a folder included in your purchase containing a full, pre-completed version of a form-fillable PDF character sheet, and a separate sheet with a more detailed character background. The pre-gens really are ready to be played with. But the thing that made me cry out in delight when I opened it was the folio of NPC portraits. 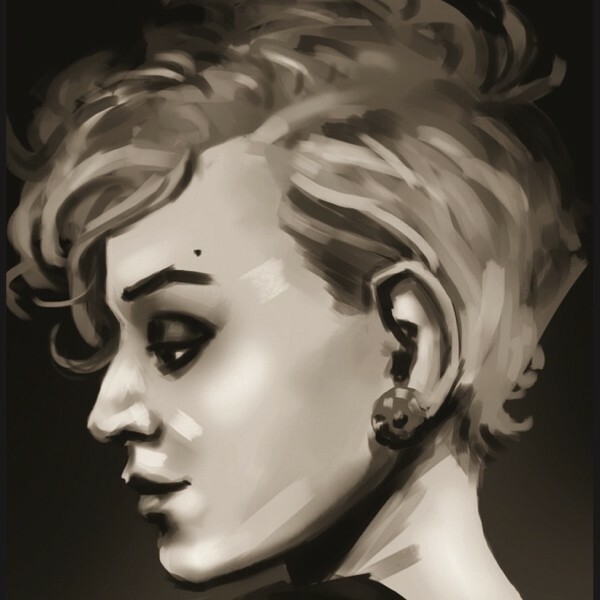 I like handing out pictures to my players and I especially like giving them NPC portraits. For my players at least it really helps them engage with the character. The portrait gives them a reminder of the name, which otherwise they always forget and they add notes to the portrait which invariably also ends up being doodled on. My children, who are part of our group, are to blame for all my NPCs having big curly moustaches, glasses and arrows through their heads. You get the idea, both I and my players like portraits. I said earlier that all the NPCs in the campaign, from minor to major, have portraits, the supplied 13 page folio of portraits has nine rectangular portraits to a page for a total 105 in total. And these images are bigger than the ones in the main book and not masked by the colour coded picture frame I previously mentioned. Huzzah! Thank you Chaosium for this, you made my day. Last, but probably not least is the Keeper's Screen, the final cherry on the top of this cake of delicious Lovecraftian goodness. The tri-fold screen art is of a rough, atmospheric wall emblazoned with a central image of Nyalathotep in his Bloody Tongue form, with a smattering of glowing and smoking cult sigils spread over all three sections. It's an appropriate image to face your players if you’re inclined to use a screen. Two thirds of the GM's side of the screen is taken up with a listing of NPCs which may be useful in play, but not very much I suspect. The remaining third contains a reminder of rules for down time player character advancement and travel times between major locations, which I can see as being very useful. 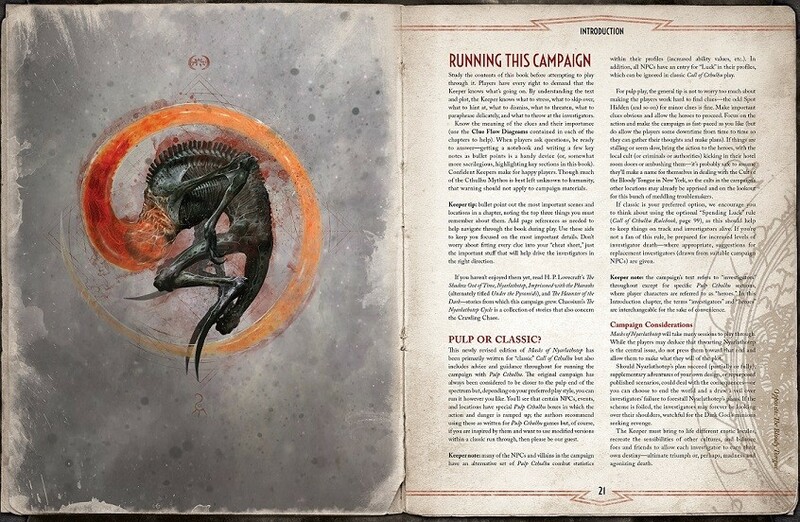 As a PDF you could print out the images and tack them to the front of your 7th edition screen and have the internal spreads as a handy reference in your notes. If I end up with a hard copy, I would definitely use it, probably by doubling up and placing it in front of my 7th edition screen. It's a luxury you don’t need, so it is awesome to have it included as part of the package. Two big questions remain: is Masks of Nyarlathotep any good and is it worth it? I hope you can tell that I am very excited and enthusiastic about this campaign. It is easy when looking at such extensive packages of material to be distracted by the bling: the handouts, compiled resources pretty pictures and keeper screen. However, beneath the bling is a solid and epic campaign clawing and writhing to escape into your players brains. It is full of fantastic stories and despite its at times, almost comically complicated webs of clues, I think it will be a delight to run. So much thought has gone into making sure the GMs job is as easy as possible. There is no denying that at £45.42 ($60 USD) it is not a cheap thing to get, and that is for the PDF version. The print version is due to top £100 ($130 USD) [including the PDF] but I don't think that there is any doubt in my mind that this will be money well spent - if you are going to run it. If you just want to read the campaign and have no intention of running it, then the PDF is probably going to be worth it. But if you are aiming to go the whole hog and get the print version, take a hard look at your group and ask yourself if you will finish the campaign. Historically many groups suffer a TPK (Total Party Kill) in Egypt and that sees the end of their campaign as enthusiasm fizzles out. Chaosium have fixed this, you are unlikely to suffer TPK, maybe just PPK (Partial Party Kill). For me, though, this book poses a substantial and weighty problem. The problem has a name: Horror on the Orient Express. As I have already alluded to repeatedly, my group is currently playing through Two-Headed Serpent. We are having a pulp-fuelled blast of a time. In the last session our nonagenarian accountant was hurled bodily and voluntarily across a gaping abyss by a huge friendly troll and the matador discovered he could ride a levitating hemisphere and fire flame pistols at the same time. But this joyful ophidian fun will soon come to an end. Sitting on my groaning and somewhat bowed bookshelf, awaiting the completion of Two-Headed Serpent is the second edition boxed set of Horror on the Orient Express. But has Masks of Nyarlathotep just nudged it into second place? There are too many fantastic campaigns to play. Chaosium don't you dare publish another one! 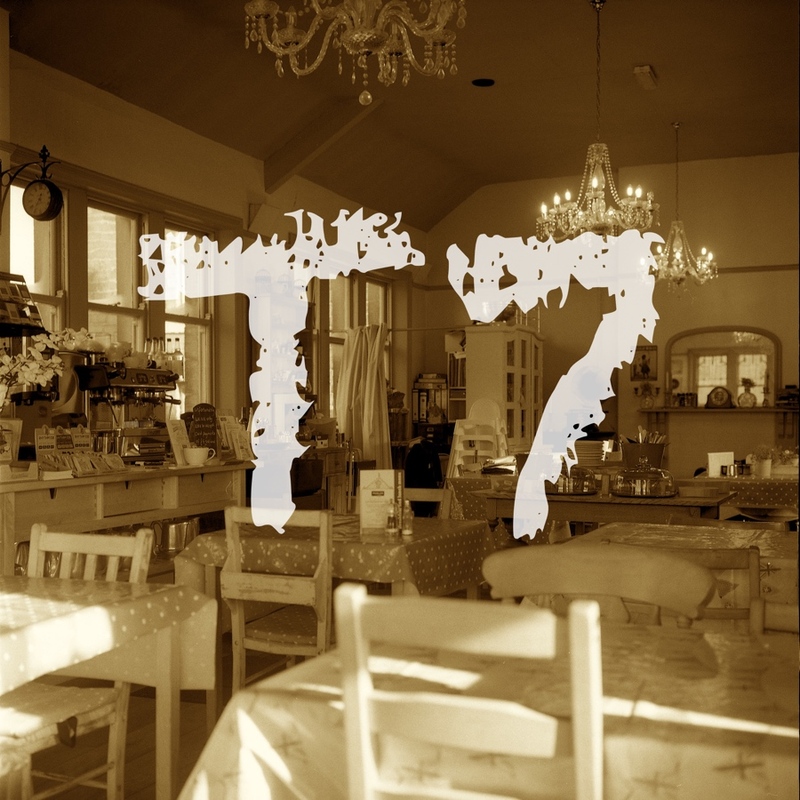 Many thanks - a great and well written review. Very kind of you to say so. It is an exemplary product. Well done to you and all the others at Chaosium. Chaosium keeps outdoing itself. Amazing stuff. Lovely review, thank you Marty. Thanks for your well written and informative review Marty. I kind of knew that the new edition was something special when I saw the quality of the samples in the previews - especially the new hand-outs - and that the new edition is expanded to 666 pages, but it's nice to have that hope confirmed by nice reviews. I'm really looking forward to getting my own hands on it now - unfortunately probably not until payday next week, as it's been an expensive month! This review make me wanna buy it. Even just for the Peru bit. Nice work. Great review Marty. I was going to bypass this one but now I am not so sure. Having the focus of the rewrite be on how to run the adventure plus all the wonderful add-ons is very enticing. We're having our "Session 0" tomorrow (creating and rolling characters) and in two weeks will be starting the Peru prologue chapter and OH GOD I'M SO EXCITED!!! I ran the original Masks campaign in the past and it was one of the best experiences I've had with any module, but the classic thing happened and the group fell apart because of scheduling priorities. Luckily my new group is dedicated to the point of ignoring their own family's birthdays so I may just get through it! Has anybody else begun the new Masks yet? I'm so damn excited I just wanted to shout out loud about it.